"Hon,Did You Call a Plumber?" I am a Çhristian—wife and mother of four—author— I love to make people smile. It’s that time of year when young people relish the briskness of the air—and the older of us bask in the beauty and the sadness of the turning leaves. A time for contemplation before we move ahead. Fall is something special for the serious woodworker. Thoughts he walked around with and vacationed with during the summer begin to take shape. Details, somehow, become more clear. He finds he can make decisions. He goes into his shop and sees it in a new way. The clutter must go; a tool needs some extra care; a bench needs scraping. 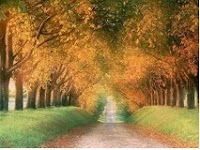 There must be a renewing and a replenishing—because he is somehow renewed and replenished and his shop is HIM! His fingers have a tingle that was not there in July—or August. Or September. He is about to build something very fine—and he knows what it will be. 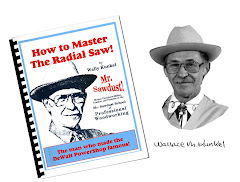 The following article is a chapter from his book, "How to Master the Radial Saw," available at the official Mr.Sawdust web-site. This was the beginning of the most exciting time of my life— the great Do-It-Yourself era. Veterans had re-turned from the War and had to do it themselves. (They also wanted to!) They came to the Home Shows across America — literally, in droves. Shopsmith was the “big” name. It was, and is, basically a lathe turned into a half-dozen other machines. Their original factory demonstrator was a fellow by the name of “Red”. I don’t remember his last name — but he was a master of woodturning. The wood seemed to melt under his chisel into fantastic shapes. He was also a great showman! Directly across the street was a Patterson Brothers tool store — and I went out of my mind every noon hour. They sold, and they demonstrated, my Shopsmith! My wife and I were having the first of our six sons and one daughter. Marc, my oldest, had outgrown his crib and needed a bed. We liked “Early American” — so my wife, Jean, told me I should buy one for him. “Where did you find that nice Birch?” he asked. This was the beginning of an ad-diction that resulted in my building an “Early American” house, 1O rooms of furniture, and searching for a way to get out of the advertising business and into the world of woodworking — as fast as possible. While Condé put together a sales force of 30 District Managers across America, I did the original marketing and sales promotion. What I’m about to show you is the cover of the only existing copy of our first literature for the little DeWalt. There! You’ve just been intro¬duced to the most successful machine that ever hit the Home Market. It had polished castings. It had a cadmium-plated saw guard and bright red control handles. And, some of you will remember — it performed! After setting-up the national pro-gram, I took Northern NJ for my District. With 125 dealers, all trained and demonstrating ( most of them with their own DeWalt Department), we made my original prediction come true. What a great bunch of dealers! Big and little hardware stores, big and little lumberyards, Mom-and-Pop operations that sold only DeWalts, and old-line machinery houses who actually resent-ed “these home-owners” coming into their showrooms (till they found out there was money to be made!). Today, one of them is among the top houses in the country — a father and son, in those days — and I remember when they were selling DeWalts out of the back-end of a pick-up and keeping their inventory of machinery in their home garage. My District never sold less than $1,000,000 worth, per year, for the next 10 years. In the Power Shop line, we had two models, the MB with 3/4 hp — and the GW with 1-1\2 hp. They sold for $229 and $349, respectively. My dealers were buying them 50 at a time. In fact, with myself and two assistants, demonstrating in the park¬ing lot of a well-known lumber com¬pany, we sold a trailer-truck-load over a weekend. 219 DeWalts! I had a dealer in Bayonne, a hard-ware store, who had no warehouse. He moved all his “islands” back and stacked his 50 DeWalt boxes in layers around in a big circle — like an amphitheater. The crowd used them for “bleachers”. By the time we got finished “cutting wood” for a few days, he didn’t need a warehouse. A fellow, named Tom Berry, was the District Manager in New York. We were at each other’s throats all the time. Good friends, but ... ! He had a very smart dealer, Howard Silken, who set up a permanent, full-time, live demonstration in the Bus Terminal in Manhattan. Most of the NJ commuters went through that station — whether by bus or subway. The more we “cut wood” in NJ — the more machines they’d sell in NY. Up to then, I thought the whole world was mine! Chances are, most of those machines exist today! You’re reading this book, for one of two good reasons: You either own an early DeWalt — or you wish you did! It’s my honest opinion that within a very few miles of you, there’s a beautiful old DeWalt just waiting for you to own it. All you have to do is find it. With this book, you’ll be able to put it in “like new” condition. In fact, better than new! So, this is the story that Do-It-Yourself America learned to love. I well remember that I “worked” the very first Home Show that was ever held in the 34th Street Armory in New York City. That was in 1948. It was also the very first Home Show to be televised — which made it a very big event. TV was in its real infancy, everything was “live” and a very pop¬ular lady by the name of Mary Mar¬garet McBride came into the armory with a huge camera and lots of long, fat wires and decided I was to be her subject. While Mary Margaret was focusing on me and my DeWalt, she also decid¬ed that I would “make something in 60 seconds”. I guess I looked a little lost because Brokenshire started coming up with suggestions — the best of which was, “Make a box!” After a little head-scratching, I agreed with him. The whole thing snapped together at “Two!” and I held up the box to a cheering, counting crowd at “Zero!”. And that’s been my name ever since. 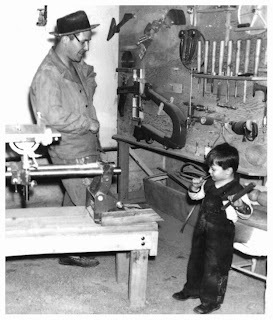 The demise of DeWalt began about 1958. We acquired a Sales Manager who was a former Washington lobbyist and thoroughly greedy. If I tell you he raised worms in his basement, you’ll understand he also had other problems. The combination resulted in his allowing Sears to sell DeWalts. It took 4,300 DeWalts to fill the “pipe-line” into the Sears stores in my area alone — and I never made a call on one of them. I resigned. My 125 dealers quit all in the same morning. I took my wife, and a nice fat commis¬sion check — and the next boat to Bermuda. Black & Decker bought DeWalt from AMF around 1960. Typical of most industry in those days (the tool industry, in particular), salesmanship succumbed to mere order-taking. Demonstration and customer-training was no more. The great Home Shows were a thing of the past because there were no exhibitors..
With competition from a new radial-saw line at Sears, B&D evidently began to lose position. They both put 12” blades on machines that were powered for 10” blades. They both talked “developed horsepower” and the customer thought he was getting more for his money. When Sears moved their elevating handle to the front of the arm, B&D bowed to them. They threw away their solid cast arm (on the smallest DeWalt) and introduced all kinds of design complications in an effort to be competitive. While I don’t know the whole story, I’m well aware of the years they simply neglected America’s “dream” machine. There are thousands of DeWalts, hidden away in unused shops and basements, that are probably as good today as when they were manufac¬tured. When you find one, make sure it has a solid cast arm and the elevating handle is on the back of the arm — not on the front. Make certain it has at least 3/4 hp (9 amps)— or, better yet, the motor is labeled “12 amps” (1 hp). Or better yet, 1-1/2 hp (17 amps). For best success, on those sizes of machines, use an 8” blade for most of your work — even though it will take a 10” or 12” blade. If you find a larger DeWalt — (but not larger than a 14” blade with 5 hp — too big for a small shop) — buy it! One thing more, it will either have a single-phase or a 3-phase motor. Three-phase DeWalts are great, if you have 3-phase power in your shop. Last thing: Plug it in. See if the motor runs. If it does not (but it hums) it may be a simple problem — like a new condensor or relay — but if the winding is burned out (very rare), forget it! For a nice finale to this section, I would like to paint a big, beautiful picture for you — with thousands of happy woodworkers, busy as beavers, turning out great works of art to the astonishment of customers and wives. I will remind you that great numbers of people succumbed to the radial-arm concept, long after DeWalt was on the decline — but I seriously doubt if even a small fraction of those well-intentioned owners ever got close to the satisfaction they sought. Let me explain: There is a world of difference between the radial-arm concept and actually cutting wood with a radial-arm saw. What may have been a highly-anticipated purchase can result in complete and utter disappointment. Most especially, if the ma-chine was a brand other than DeWalt. With a couple uneducated moves, the thrill can disappear very quickly! And it can be replaced with pure fear. Attesting to that, one of my sons recently purchased a mint-condition DeWalt, 40 years old or more. The owner had made one cut with it and something happened. Whatever it was, he put the machine back in the box and never opened it again. We bought it from his widow (he had died a natural death!) for a ridiculous price. The only thing wrong with it was the operator. He had purchased it from a source who knew even less about it than he did. He had bought a box full of ignorance. Most of the trouble stems from: Table-saw vs. Radial-Arm saw. Almost anybody can operate a table-saw because he understands one thing: HE will have to PUSH the board for every cut he makes. This also means that he is com¬pletely responsible for the results he gets. If his cross-cuts are a little off-square or his miters have a little gap between them, he has no one to blame but himself! The machine, of course, could have done it perfectly — if only he were more professional. And he accepts that as a fact. Not so with a radial-saw. That ma¬chine is always assumed to be at fault — never the operator. Oddly enough, this is not far from the truth. But the real truth is that the operator knows too little about his machine. And, over the past 30 years (specifically, since B&D bought it), there were too few places for him to go for knowledgeable help. Long gone are the days when machine and tool manufacturers vied for position and acceptance in front of the public — in an actual win-or-lose struggle. Virtually gone is the dealer who can professionally demonstrate a radial-saw (even a table saw! ), pro¬fessionally align it, and guide the customer toward the satisfaction for which he is paying. Equally unfor¬tunate is the fact that over 20 different makes of radial-saws have come and gone (or should go!) — each one sucking up little or large portions of the market — and few of them deserving of a crumb. The abilities of a DeWalt (and I speak only of DeWalts throughout this book) are almost unbelievable. As a saw (80% of your wood-working), as a dadoing-machine (10% of your woodworking), and as a shaper (3%) — older DeWalts are absolutely unbeatable. However, the same DeWalt — in misalignment, or with the wrong blade, or in the wrong hands — can not only be frustrating —it can maim the operator for life. And that just may be YOU. This is just as true for a table-saw — but, remember, that machine is never wrong! It’s your fault when you can no longer count to ten on your fingers. There are few (if any) sources for learning to “master” a DeWalt. I know of absolutely none. The next best thing is a book like this. It's Here! "Our Kunkel Family in America"
An extensive, beautiful work—representing sixty years of research! 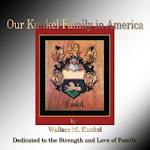 My dad, Wallace M. Kunkel, was a genealogist for the Kunkel Family. 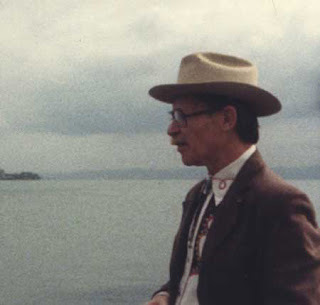 After he retired from his careers as a writer and woodworker he spent many hours—days—weeks—months, researching and recording for the Kunkel family. The result is an incredible work-over 700 pages. He hoped to see it made available but that did not happen. Even during his final days at home before he died he was adding finshing touches to the work. He left it to me in hopes that I would find a way to publish it. So...eleven years later—with the help of my husband Ed Walsh—we have succeeded! A labor of love—and we are very pleased with the final product. How do you join books about woodworking, with stories of family and faith? ...With a "Dove-tale" of course! Growing up within a family of woodworkers I learned early on to look for dove-tail joints in the drawers of furniture. I knew that dove-tails were an indication of quality in workmanship and of a piece of furniture that would far outlive me. I also learned within that household of seven children—six boys and one girl— to appreciate the wonderful and rare gift of closeness that a family can experience; a closeness that develops through living the happy and not so happy times together—that "dove-tailing" of shared experiences, which joins a family for life. At the age of twenty, I was given the precious gift of faith in Christ, a faith that has seen me through some difficult journeys of my own, and like that dove-tail joint, it is a faith that has endured. Our lives are filled with stories, unique to our experience. And through those experiences, indelible memories are made—memories to be passed on, insights to be shared. Through sharing, we may encourage others in similar situations. The books on this site are all related in some way, authored by Wallace M. Kunkel, father of those seven children and myself, Mary B. Walsh, his only daughter. The purpose of this blog is to introduce you to each one—and as products are added, introduce them as well....so let's get started.